Eating out at a good restaurant with limited budget in Barcelona is not a dream. From tapas to Mexican local food, from local and traditional Barcelona drinks to Mediterranean exclusive menu's price is reasonable in Barcelona city if you make your decision right. In this article below you can find cheap and good restaurants in Barcelona city. No matter whether you like casual or more chic restaıurant, there are lots of restaurant options according to your decision. We will continue to let you know the cheap restaurants in Barcelona below. Please don't forget to read our other articles for your best Barcelona Travel. We hope to be your best guide in Barcelona city. 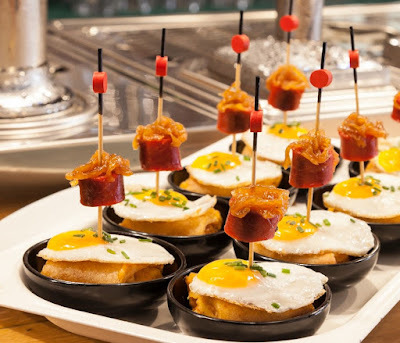 Enjoy the food and drink in Barcelona. Cat Bar: If you are vegeterian, this rocking bar is perfectly matching your appetite. Big vegan burgers, beans, patatas bravas, tortilla with gluten free and beer! In Barcelona, Cat Bar is extraordinary choice for your lunch or dinners. With its cat decoration items, Cat Bar in Barcelona city is a good choice to eat out at a reasonable price. Besides, the owners of the bar are very welcoming and looking forward to host its visitors again. The Cat Bar is at La Boria, 17 street. You can arrive there by Metro Juame 1 L:4 . For cheap but good vegeterian food Cat Bar is the best choice. La Taqueria: A Mexican food in Barcelona city at a resonable price. You can't miss it if you like to try worldwide food. You will have chance to try Mexican street food in Barcelona. You can have tacos and quesadillas. At weekends we suggest you try also chicken with mole sauce but don't forget to make your reservation at weekends as it is crowded on these days. When it comes to Mexico, margaritas are the best to try. Even if you are vegetarian there are menu options for you. For the good fajitas don't forget to reserve your table at La Taqueria. If you don't try Guacamole with your food you may regret when you come back. It's a sauce made with avocado, tomatoes, salt, chiles and onions. La Taqueria is near La Sagrada Familia Basilica. It can be a good choice after your visit to Basilica. You can make reservation by clicking here.